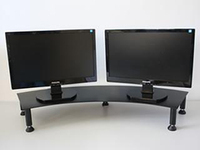 Fluteline Metal Dual Monitor Stand can be used on a rectangular or corner desk as the curve follows the same rotational arc of the head. Great if you wear prescription glasses as you can set the distance for the correct focal length. Easy to install as the curve sets the correct angle of Monitors Height adjustable on all 5 legs, Middle leg is to prevent the monitors tipping backwards. Manufactured in steel and powder coated colours.